With any hobby, over time you acquire some tools that help make the tasks more enjoyable. A painter needs brushes, a knitter needs needles, and a seed sower needs a good set of seed sowing spoons. Do you have any seed spoons? I got these from Lee Valley Tool Supply. If you look closely, you will see little indentations of different sizes on the tips. These are good to use when you are sowing tiny speck-like seeds. The kind of seeds that when you put them in the palm of your hand you immediately start to worry that if you sneeze, they'll all be blown away, so you think you really might sneeze. With these spoons, you can pick up just one or two of the tiniest seeds at a time from the packet and plant them more precisely. And once precisely planted, you need some shelves to put the seed flats on. 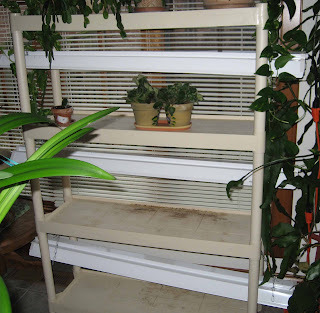 These are the plant shelves I described the other day. What I forgot to explain is that the lights are hung with chains so you can raise and lower them as needed. I start out with the lights nearly on top of the clear dome lid of the flats, and then gradually raise them up as the seedlings grow. By the time May arrives, the tomatoes and peppers are touching the lights, even with the fixtures raised as high as they will go. You can tell that I've had these shelves for a few years, try 15 or so, because the shelves are a bit grungy. Really, you would think I might have some pride and not reveal something that is all dirty like this. But I think if you can find these plastic shelves and inexpensive light fixtures, it makes for a good alternative to those expensive plant shelf units sold in catalogs, so I'm swallowing my pride and showing you what they look like. Plus, by the way, these shelves are easy to take apart, so if you don't have room to keep them up all year, you can take them down and store them away. I used to do that for several years until I had a sunroom where I could leave them up all of the time. And how do you keep from getting soil all over the place when you are filling seed flats? It helps to have a "tidy tray". I also got this from Lee Valley. 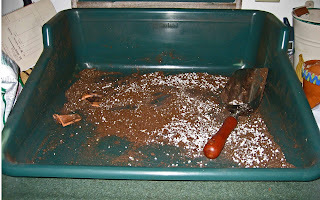 As you can see, I need to clean it out and give it a good scrubbing before I use it for seed starting mix. After all, there might be some "damping off" fungus lurking around in it, just waiting to jump into a newly planted flat of seeds. That would not be good! While I'm at it, I promise to scrub those shelves, too. And laying in the tidy tray? Bonus tool! That's a scoop. But you all knew that. I did spend some time browsing through seed catalogs this afternoon, so I'm making some progress on choosing which seeds to buy this year. So far, I have decided who I am not ordering from and which seemingly un-related seed companies are all the same place with different names, because they all have the same address in Wisconsin! I feel a bit deceived! I also stopped in at the local Menards earlier today to look at seeds, but they don't have any seeds out yet. What are they waiting for? It is not as if all those snow shovels and snow blowers are going to sell this season! Seed spoons! OMG! Never knew they existed! I want one! I have used everything from old spoons, scoops, fingers,... For those tiny tiny seeds I bet it works good. My shed has an old wooden counter that is wonderful for doing all my gardening. But time is showing on it and the shed. I'm planning on an overhaul and remodeling job as soon as it's warm enough to paint. My husband is a painting contractor so hopefully I will grab him on a weekend and he and I will do the outside and I can do the inside myself. Thanks Carol for your wonderful ideas and the seed spoon info. I didn't know about seed spoons either. Did your dad have seed spoons? Remember when he made a little 'greenhouse' along the back of the house?